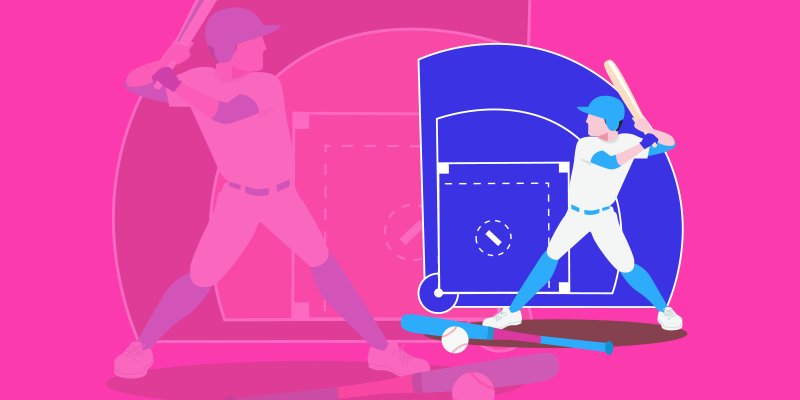 Every marketer knows conversions don’t happen instantly, but many aren’t aware that their keywords serve different purposes, kind of like the many roles that make up a sports team. 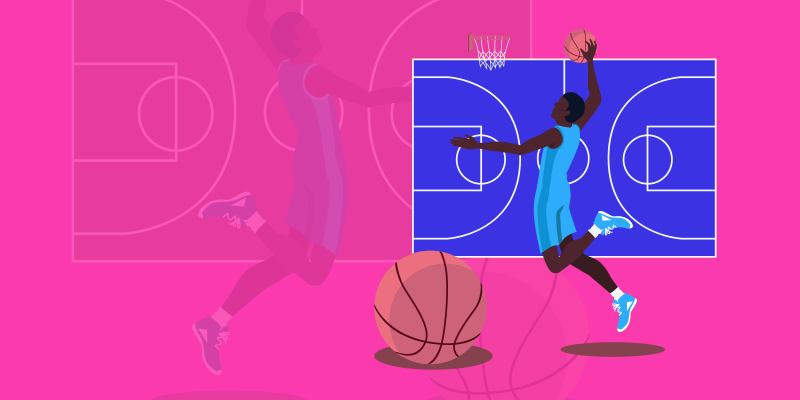 Keywords can be initiators, playmakers, or scorers. It’s important to recognize that your keywords are team players, and value must be assigned to them based on their role. This can be done through attribution modeling. Attribution modeling is nothing new, yet can be an intimidating topic for marketers and Adwords users. This might be due to the cryptic looking reports, or maybe the fact that most blog posts around the subject tend to focus on the complexities and challenges, rather than what can be accomplished. It’s one of those areas in Adwords that many marketers simply like to stay clear of, and end up missing out on a lot of important data. If you’re not utilizing those reports, there’s a good chance you’re under serving yourself, or your client. The good news is that marketing attribution modeling isn’t the menacing beast it’s often made out to be. We’re going to hold your hand and simplify things as much as possible for you to get a handle on this, and show you 3 easy ways to improve your Adwords accounts. An attribution model is how conversions are attributed and dispersed. 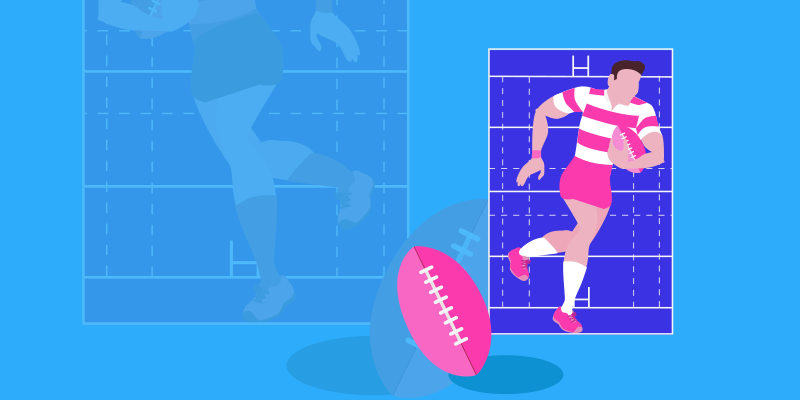 If you’re brand new to the topic, you check out our visual guide to marketing attribution models. Essentially, you get to choose what’s more important as it relates to a conversion: the first click, last click, middle clicks, and the different ways it can be dispersed. By default, Adwords uses the “last click” model, which attributes 100% of the conversion to the last keyword/ad the user clicked. If there was only one visit necessary for every single prospect's journey to become a lead, this would be all we ever needed. However, this is rarely the case and so it’s nearly impossible to efficiently manage a campaign with this data alone. Why? Because we’re missing out on all the important stuff that happened in order to warm that prospect up to become a lead. If you manage your bids to optimize for a last click model alone, you’re undervaluing your initiators and playmakers. Using the default last click model, it’s very easy to overestimate branded queries, and undervalue your workhorse keywords driving initial visits. A visitor initiates a broad search for a service or product that you provide (e.g. trailer manufacturers), lands on your website and takes a quick glance at your landing page. They were content with their quick visit, but wanted to do their due diligence and left to view some competitor websites for comparison. The next day they search again, but this time the search was more specific and based off of what they learned the previous day (e.g. tandem forestry trailer manufacturers ). 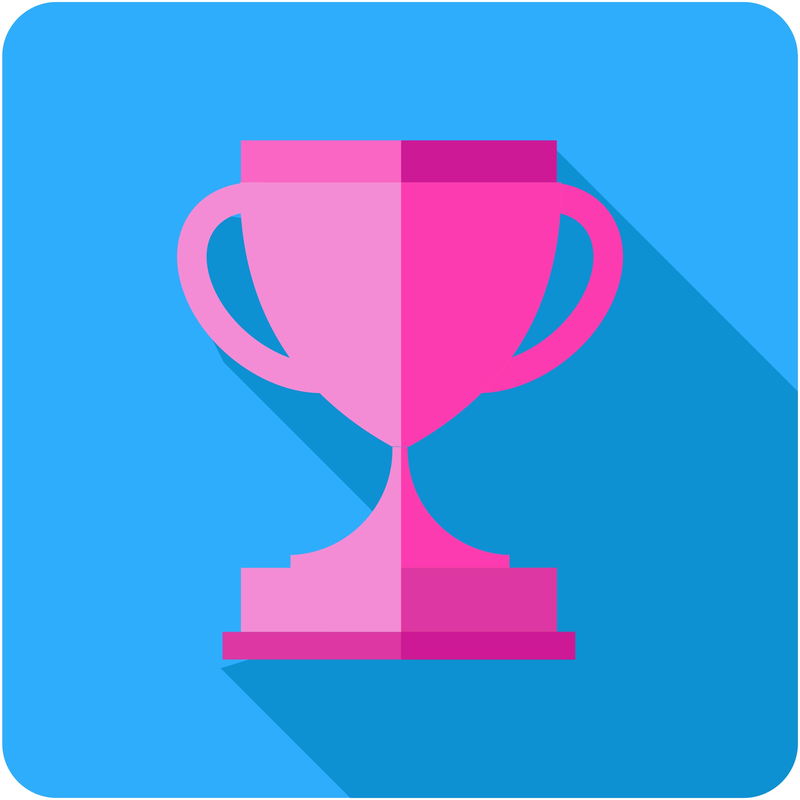 They landed back on your site, remembered your brand, and this time took the time to read much more of your content. They were happy with their experience, but still weren’t ready to convert in that moment. The third day they searched directly for your company name (which is in their memory at this point), clicked on an ad, landed on your website again, and this time they called you. Overestimating branded keywords because they’re converting high, and are low cost. Undervaluing your key initiators because they’re not converting high and are expensive. Being unaware of your top assisting keywords because it’s difficult to gauge their true performance. However, if you’re using attribution modeling to help you understand and optimize, you’ll be able to measure the true value of the different types of queries. 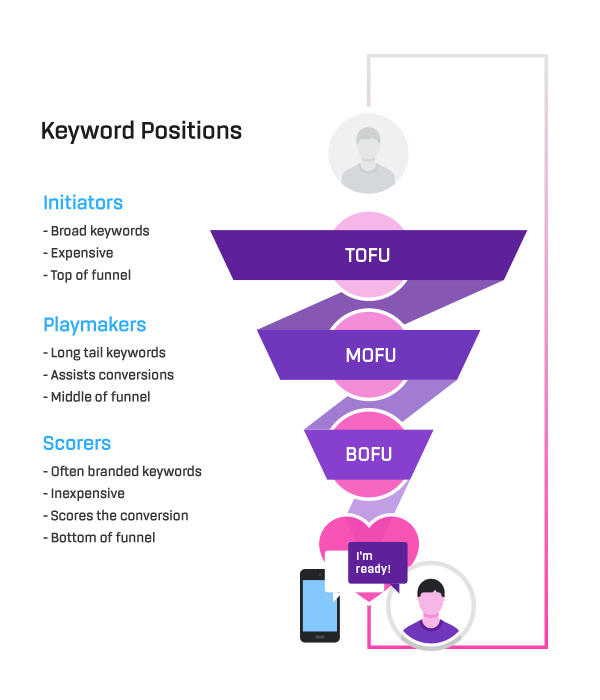 See the illustration below to see how these different types of keywords work together and relate to the marketing funnel. At this point you should have a clear understanding of the different types of keyword positions, how they support each other, and the importance of measuring their real values. Our hope is that you’ve learned something new, and can’t wait to uncover this new data and take your Adwords expertise to the next level. But we’ve got one more step before you dive in. We’ve discussed the “why” and now it’s time to talk about the “how”. These broad type keywords (e.g. trailer manufacturers) are your front row players, and the most expensive since there is more competition for them. They are also likely to convert much lower than bottom of funnel queries since the point of an initiator is to connect with a prospect early in the buying process. So how can you discover which initiators are your top players, and which ones need to be cut? Simply run an attribution report in Adwords that compares your conversions with last click model against first click model. You'll be able to identify which keywords are sending prospect's down your conversion path, and which ones can safely be removed. Playmakers tend to be more specific than your initiators (e.g. tandem forestry trailer manufacturers), and assist the customer down the buying path. These support role types can easily go unrecognized, but identifying them can make a critical impact on your bidding strategy and overall performance. Using the same attribution modeling report, compare last click model against the linear model to discover the team players who are helping the most prospect's along the conversion journey. 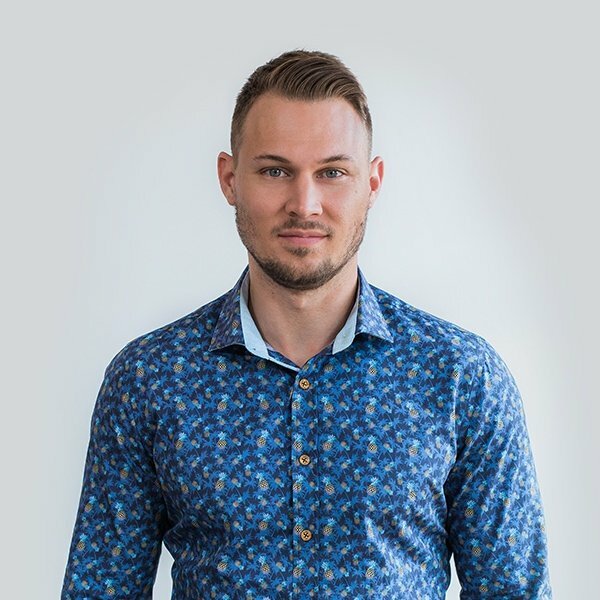 This is most helpful for companies who have a considered buying process, where several touch points are required before acquiring a lead or sale. 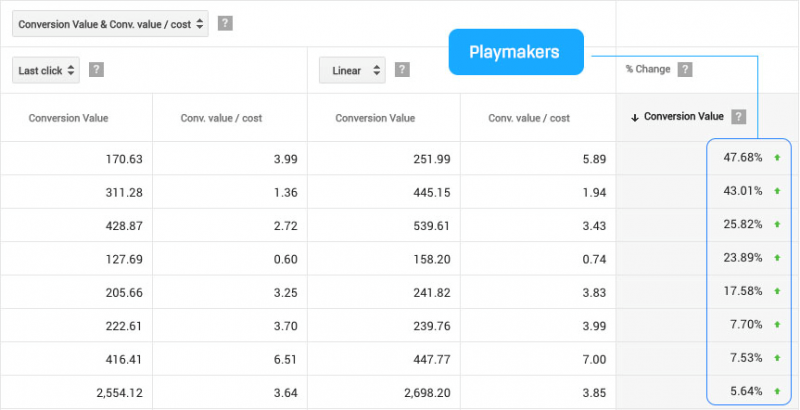 Turn this data into action by adjusting bids for the playmakers who do the best job supporting your scorers. While the last click model is great for measuring the conversion value of a keyword, you might be surprised when you use other models to view the same metric. This is a great way to find undervalued keywords who are positively contributing to your ROAS. 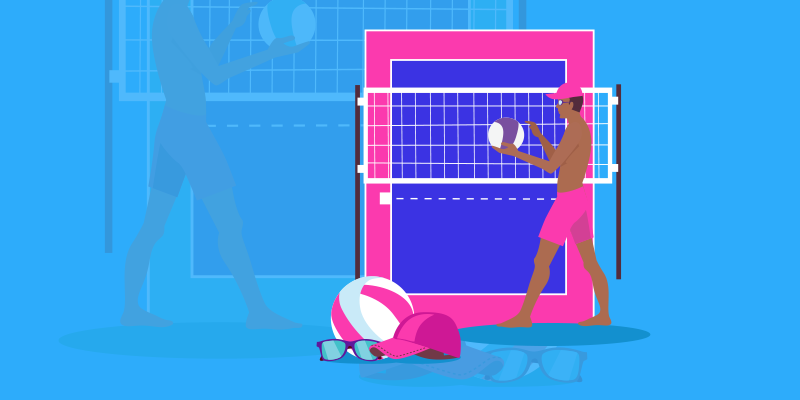 If you’re new to using attribution models in Adwords, there’s a strong chance there is some low hanging fruit you can take advantage of right now, and see some quick improvements. As you can see, just like a sports team your keywords shouldn’t be looked at with a “top scorers only” mentality, but should include a full and balanced roster each with their own set of KPI’s.